A slow-cooked stew is hard to beat; meltingly tender meat in a rich, flavoursome sauce, accompanied by mash and a plethora of vegetables, make it one of the most satisfying meals to cook and eat. This recipe from Eric Chavot and his Michelin-starred, eponymous brasserie takes inspiration from traditional French cuisine, using cloves, cinnamon and orange and lemon peel for a warming kick. Gently season the beef and colour in a heated frying pan until golden all over. Remove the meat and set aside. Quickly fry the bacon rashes, and then set aside with the beef. Using the same pan, gently cook your vegetables until golden brown, soft and sweet. Add the tomato and cook gently for a couple of minutes. Remove the mixture from the pan and drain in a small colander. Deglaze the pan with the wine, bring to a gentle simmer and reduce by half. 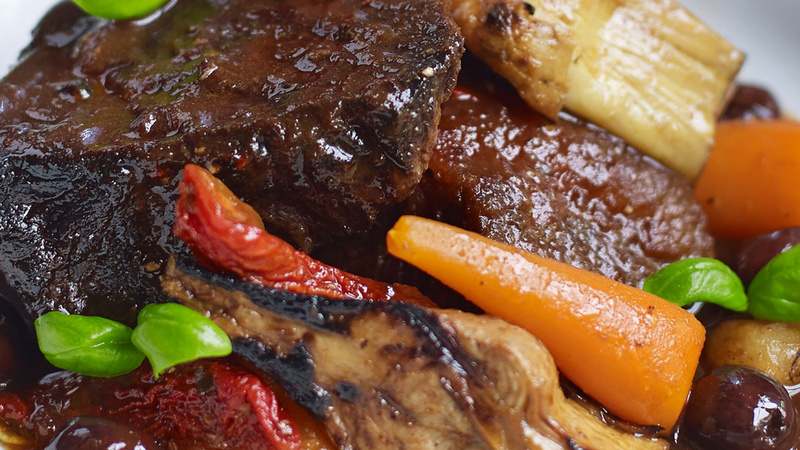 Place the beef in an ovenproof casserole dish; add your bacon, vegetables, wine, veal stock, spices and herbs. Bring to a gentle simmer, cover with a paper cartouche (baking paper cut into a circle that fits snugly on top of the ingredients in the saucepan) and a lid and place in your preheated oven at 210°C / Fan 185°C / Gas 6.5. Cook gently for up to 3 to 3 ½ hours. When done the meat should feel soft to the touch and have no resistance when your prick it gently with a fork. When ready, remove from the oven, and leave to stand until tepid. Remove the meat gently from the casserole into a deep dish, and cover with cling film. Strain the sauce through a fine sieve into a clean saucepan and reduce to a nice shiny sauce consistency. Add the meat when done. Serve with a creamy mash potato and a garnish of glazed button onions; glazed baby carrots, niçoise olives, semi-dried tomato and chargrilled baby artichokes. Want to nail the wine pairing? Wine expert Jane Parkinson suggests a Domaines Paul Mas Vinus Malbec and a Les Jamelles Syrah.